All-New Music! All-New Visual Themes! What does this mean? New ways to experience the game! 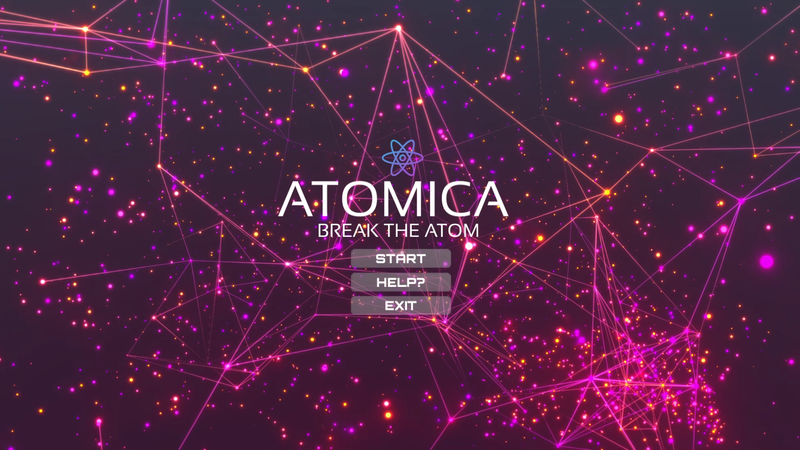 While the new additions are mostly cosmetic, we're also working to bring in gameplay changes and a possible leaderboard (if I can get it up and running)..
ATOMICA - Break the Atom! 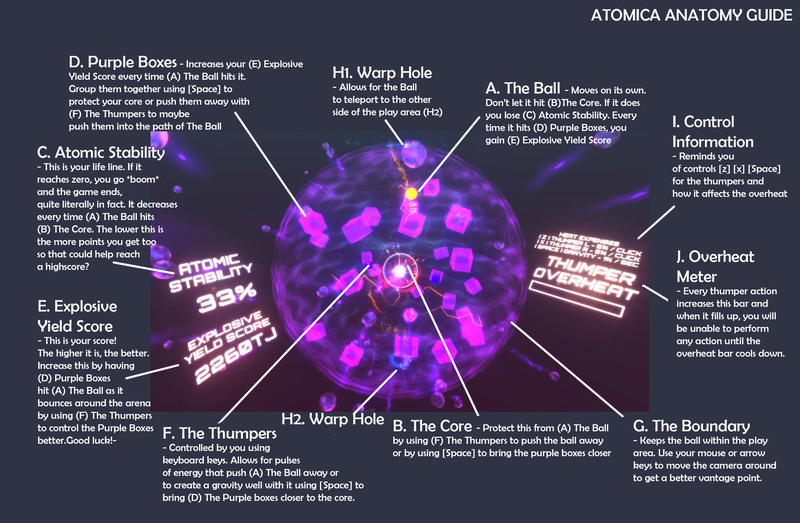 Your mission, should you choose to accept it, is to protect the central core of the atom long enough to gather a high Explosive Yield Score (EYS) by pushing the yellow ball into the purple boxes to gain more EYS using the Thumpers (controlled with Z & X / leftCtrl&alt ) and the Gravity Pull mechanic (activated by holding down Space). Move the camera around the arena with the left mouse button (or WASD/ArrowKeys) in all directions and watch out for overheating. The higher your EYS, the better your final rating! What is in a rank? Well that's up to you. In linear game views, a rank is an indicator of your ability but what are we truly measuring here? We have been conditioned through academic tests to think that an F is bad but is it really? Remember that you're splitting an atom here, so by getting a low score, it could mean that you're just really not that good at making things go *BOOM*, which is great for humanity because lets be honest, what good has an explosion ever done for us? Courage in the face of certain defeat and death is the greatest valor a human can have. Though that may arise, you can have the greatest courage every day by believing that there always is a winning scenario even though everyone says it's a no-win. Get on this list by posting a screenshot/video of your S-Rank score! - GO BEYOND S RANK. PLUS ULTRA? Current songs are temp and will be replaced in coming versions. New Music! New Visual Themes! New Gameplay? Thank you with love and some updates! Sticky[Feedback] Tell me about your Atomic experience! Tips To a Better Score?